"the most exciting fashion exhibit up anywhere in the world right now"
This is what Fashion Week Daily has to say about the exhibition Catwalks at the NRW-Forum in Duesseldorf, Germany. 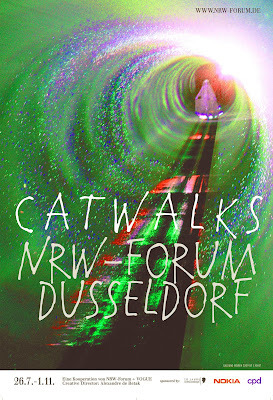 The new show at the NRW-Forum is Catwalks and what a spectacular exhibition this promises to be! This show is about the theatre of fashion, which at the catwalk shows in Paris, New York and Milan is, for some designers, taking precedence over the actual fashion itself. It is also an exhibition for everyone interested in multi-media and video installations. An absolute feast for the senses! You, the visitor, will receive a headset on entry to this exhibition and will then actually walk the catwalk through nineteen of the most impressive fashion shows of the past thirty years. All around you will experience the catwalk shows by way of a 3D, multi-media installation. The show has been designed by Alexander de Betak, one of the greatest directors in the fashion business, and is brought to you in partnership with Vogue. U-Bahn Tonhalle/Ehrenhof The entrance to the museum is where the flags are opposite the park (Hofgarten). Don't walk as far as the main road facing the Rhine. You enter the exhibition at your own risk.